I Started coming here a few years ago after seeing this on Draft Magazine’s “Top 100 Beer Bar” list. It’s a small and intimate bar with about 20 seats that line the narrow bar. It can get a little bit crammed, but if you’re lucky, you can probably get one of the 10 seats at a table in the front that can also double up for some great people watching. Proletariat shows that a small, well curated tap list is light years better than the high-tap-volume bars in mid-town. I think they capped their at 15, but you’re always sure to find something interesting. There area also options for half pours, so you can probably explore the entire menu in a nice long session. The atmosphere is nice with old school hip-hop playing and old school tattoo art all over the length of the wall. They don’t serve food, but you can bring some in from one of the restaurants on the street. This place is worth a visit if you’re in the village. 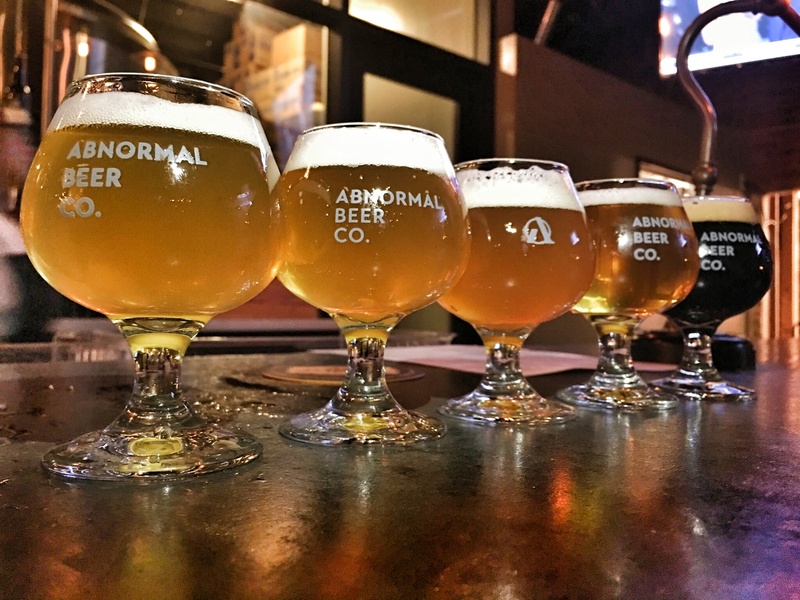 The Cork and Craft / Abnormal Beer Co is a newer spot that’s popped up in Northern San Diego and already making some waves. It’s a unique all-in-one place that brews their own beer and makes their own wine. They seem to be pretty well connected considering they’ve already done collaborations with The Bruery, Alpine Brewery, St Archer and Mostra Coffee Roasters within their first year of opening. Their beers are good – real good – which makes it nice that they offer flights to taste a few of them in a sitting. The 40-something tap list speaks for itself and you can find a nicely curated selection of beer outside of what they brew onsite. The selection is diverse and ranges over many different styles from Lambic to Double IPAs with a concentration on California beers. They also have a nice bottle selection and occasionally offer some vintage bottles. The food menu is diverse and offers something for everyone – whether you’re a carnivore or vegetarian. The good thing is that although the food is certainly on the higher end, the price point is reasonable so it won’t break your wallet. This is worth visiting regardless of whether it’s for a pint or dinner. It’s worth the drive further up North. It’s also only 15 minutes from Stone Brewery and The Lost Abbey, so there’s always that too. Another beer destination in the North Park section of San Diego. This place is located a block away from Toronado and is right on the main strip near the big “North Park” sign, so it’s hard to miss. As expected, this place has a large selection of San Diego and California beers, but you can find some surprises as well. Cantillon, Drie Fonteinen and other rarities have been known to make appearances on the shelves every so often. Even if you’re not into beer, you can still go there to buy wine, soda and cheeses. Like the other location, this one offers some beer on draft but it’s pretty limited (4 taps). If you’re visiting Stone (Escondido location) or Lost Abbey and you’re looking to grab some great bottles, then Holiday Wine Cellar should be your bottle shop of choice. They’ve been around for over 50 years and have the best service and bottle selection in the area. They have a great selection of beers from the San Diego and the rest of the country along with some international rarities. Of the several times I’ve been there, I’ve picked up bottles from Council, Russian River, Toolbox, Beachwood Blendery, Westvleteren, Cantillon – I think you get the point. They also have an extensive selection of wine, spirits and cigars. Another great service that this store offers is that they will also ship your bottles home – whether you purchased them there or not. They’ll pack the bottles for you in a shop with bottle shippers and insure them legally since they’re an authorized shipper of alcohol. It’s a great service if you want to send your stuff home and be able to enjoy the rest of your trip without having to worry about getting your bottles home. I’ve sent up to 25 cases of beer home at one time without a bottle going missing. Needless to say, this is a great place and worth visiting if you’re in San Diego – whether it be to purchase bottles or send bottles home. 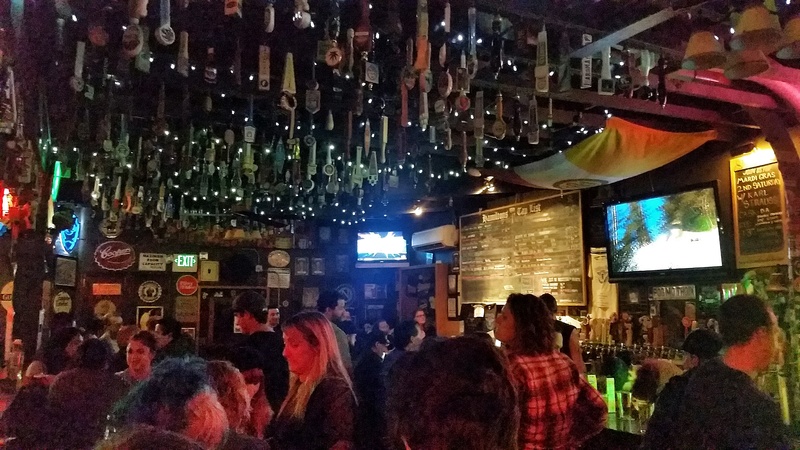 This was one of the bars I visited during my first trip to San Diego. It’s located on the outskirts of the Gaslamp Quarter on the corner of 8th Ave and G Street. What originally drew me to this place was the smell of their amazing burgers. I had no idea that that had a good beer selection, so that was certainly a nice surprise. Gaslamp Quarter can be a bit baron when it comes to bars with decent beer so this comes as a haven. The place is dark and the bar area is small, but there’s plenty of seating and a small outdoor area to accommodate. The food menu is mostly burger based but they offer a black bean burger in case meat isn’t your thing. The 30-beer tap list changes frequently and is mostly California dominated, so be sure to visit their website to pick your beer before heading over.